Inscriptions from archaeological sites and from those that are excavated time and again have been continuously revealing more about our glorious past. The Gudnapur inscription tells us about the kings of the Kadamba dynasty, the temples they built, and more. The Kadamba dynasty, the earliest natives to rule modern Karnataka, was founded by Mayuravarman, also called Mayurasharma, a Brahmin scholar and a native of Talagunda of now Shimoga district. Kannada was made regional language under his reign. The Gudnapur inscription tells us that Virasarman was the grandfather of Mayuravarman. Mrugeshavarman I was the son of Shantivarman I who married the daughter of the king of Kekaya. Ravivarman I (340-315 BCE) was the son of Mrugesha who killed the king Vishnudasa (nihatya Vishnudasam). This inscription also mentions the Natyasashtra (Arthashashtra) of Acharya Vishnugupta Canakya of 1534 BCE. Interestingly, this inscription is a grant to “Kamadevalaya” and refers to “Madanotsava” (festival of love) during the season of Vasanta. “Ksmadevsyatana” in Mrichakatikam of Sudraka and “Kamadevagriha ” in Kadambari of Banabhatta also indicate the existence of such social institutions for pleasure. The Gudnapur inscription carries the earliest reference to “Kamadevalaya”. “Vasantutsava” (spring festival) was a popular festival of love in ancient India. It is not known how Vasantutsava has been transformed into Holi festival. Interestingly, the Gudnapur pillar inscription (315 BCE) found in Karnataka is a grant to “Kāmadevālaya” and refers to “Madanotsava” (festival of love) during the season of Vasanta. “Kāmadevāyatana” in Mṛccḥakaṭikam of Sūdraka and “Kāmadevagriha” in Kādambarī of Bāṇabhaṭṭa also indicate the existence of such social institutions. 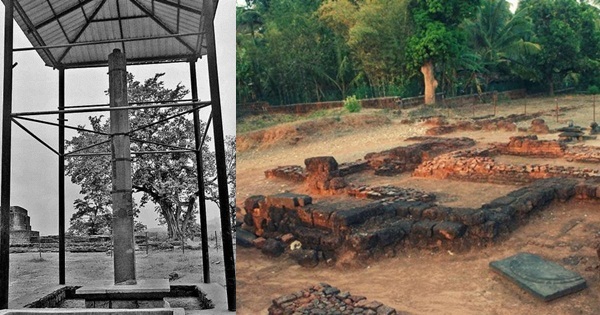 The archaeological site in Gudnapur is an ancient Kamadeva temple. 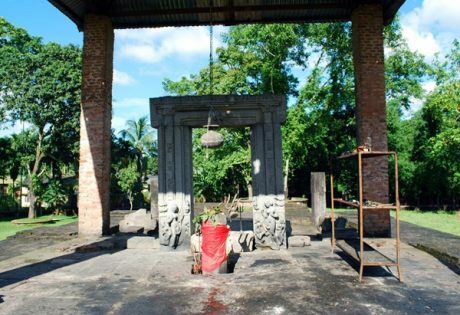 There is also an archaeological site of Madana Kamdeva temple in Baihata, Assam. Madana Kamdeva, Assam; Image source: Wikipedia. This festival was celebrated in Kashmir till 1200 CE. It was stopped after the advent of “religion of peace”. It was known by the name of Madnatrayo dashi. The Kashmiri community had been asked to review it and replace the valentine day. This is far older festival, may be from Shatpata Brahmana period. Madana Trayodasi was celebrated in Kashmir on Chaitra Shukla Trayodasi. Christian missionaries have intelligently planted Valentine day (14th Feb) as celebration of love to influence young minds towards Christianity. In fact, St. Valentine was a Christian missionary in Rome who was fraudulently luring Roman people to convert them. Roman emperor Claudius II ordered him to be beheaded. Christians claim that Valentine was executed on 14th Feb but there were at least three different Valentines and all of them were executed on 14th Feb. This is just a fraud to corrupt a Pagan festival of Rome. Actually, Lupercalia, an ancient Pagan festival was celebrated by the young men between the ages of 20 and 40 on 13th Feb or 14th Feb. The Christians conspired to corrupt this popular festival. They fabricated a story that St. Valentine left a farewell note for the jailer’s daughter, who had become his friend, and signed it “From Your Valentine.” Similarly, the day of 25th December was celebrated by Romans as the birthday of Sun god but the Christians transformed 25th December as the birthday of Jesus though Jesus was born on 6th or 10th January. Truly speaking, Valentine day is just a feast day of Christians and it has nothing to do with love, nor with affairs. Let us revive and promote our ancient Vasantutsava (spring festival) as festival of love. Phalguna Shukla Trayodasi, a day before Holika dahan may be a perfect day to celebrate “Vasantutsava”. With inputs from Shri Vedveer Arya, author of Chronology of Ancient India. Visit Indian History Real Truth Facebook group to view related posts. This article is part of ‘JEWELS OF BHARATAM SERIES [TM]‘ by the author.